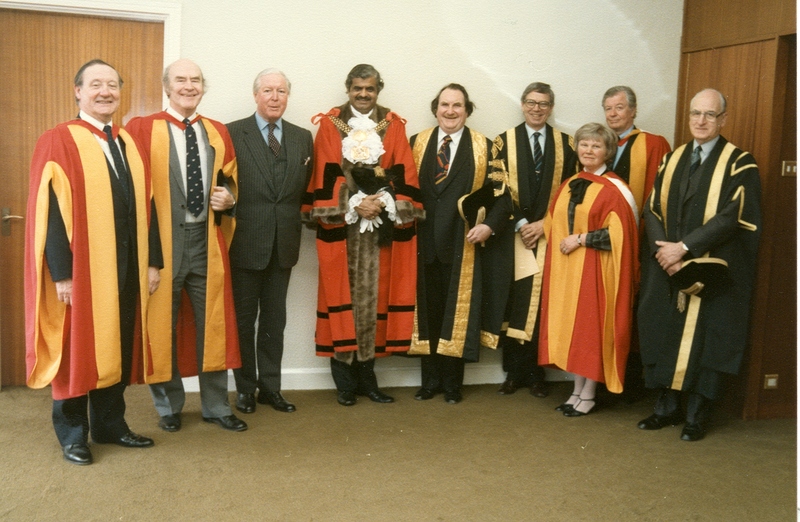 Wine, Saffron and Gold: who chose the University of Bradford’s robes? The splendid costumes worn at University of Bradford graduation ceremonies are part of the pageantry that makes the ceremonies such special occasions for students and their families and friends. 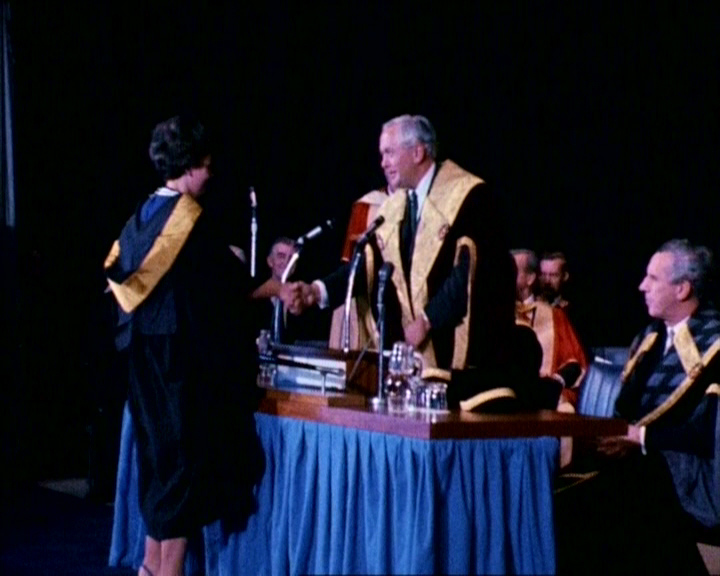 Still from the 1960s film Potential Graduate, depicting a student receiving her degree from the Chancellor Harold Wilson. A very rare colour image from this period, this shows well the saffron and gold trims on the gowns. The costumes are known as “academic dress” and derive from the clothes worn by scholars at the earliest universities, during the Middle Ages. 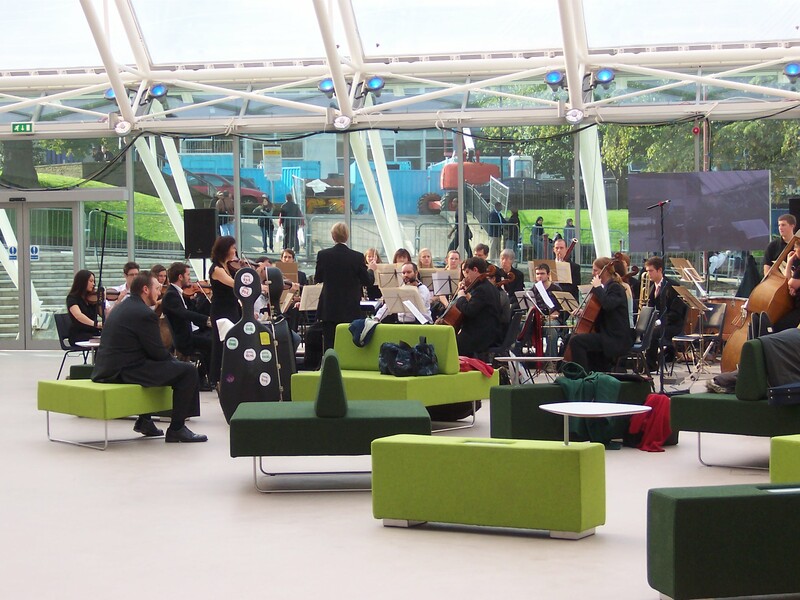 Each university has its own academic dress and staff taking part in graduation processions wear the outfit of the university from which they received their degree. Note also the use of fabric, colour and trimming to denote the type of degree or rank of the individual, again something typical of medieval practice. Undergraduates have the simplest designs, with more colour and decoration for higher degrees; the Chancellor and other University officers wear the most elaborate costumes. 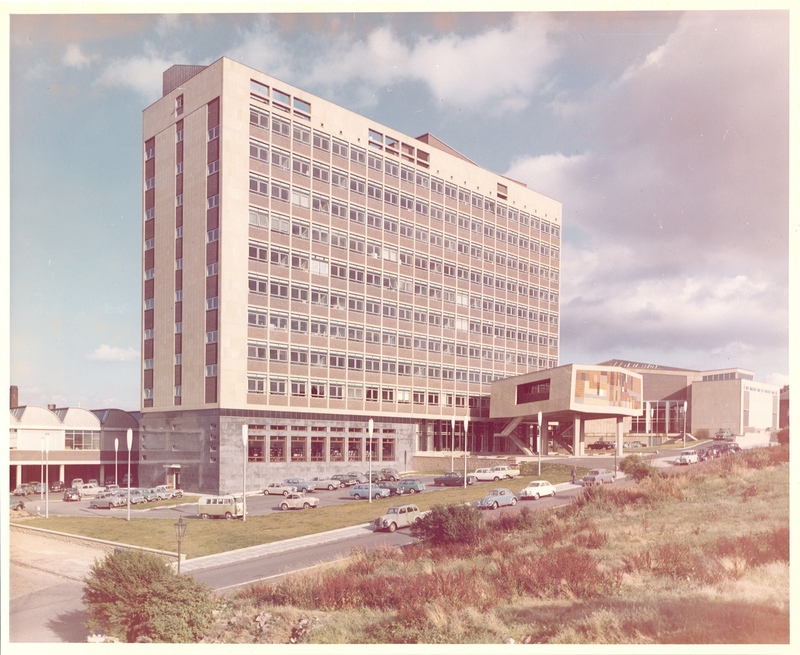 In 1965, the Bradford Institute of Technology was working towards its transformation into the University of Bradford. This included deciding on its heraldic and ceremonial identity, expressed in the coat of arms and the academic dress. 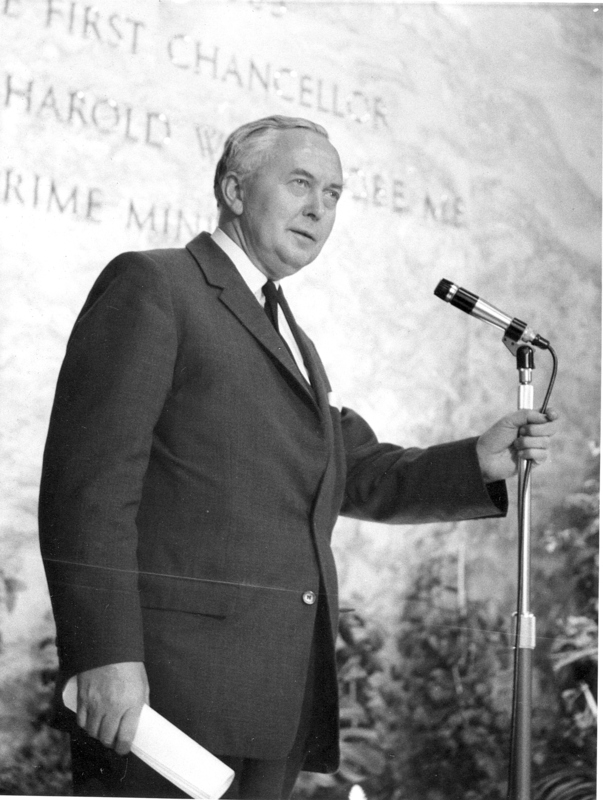 A Committee was set up to investigate and make these choices, meeting several times during 1965 and 1966. 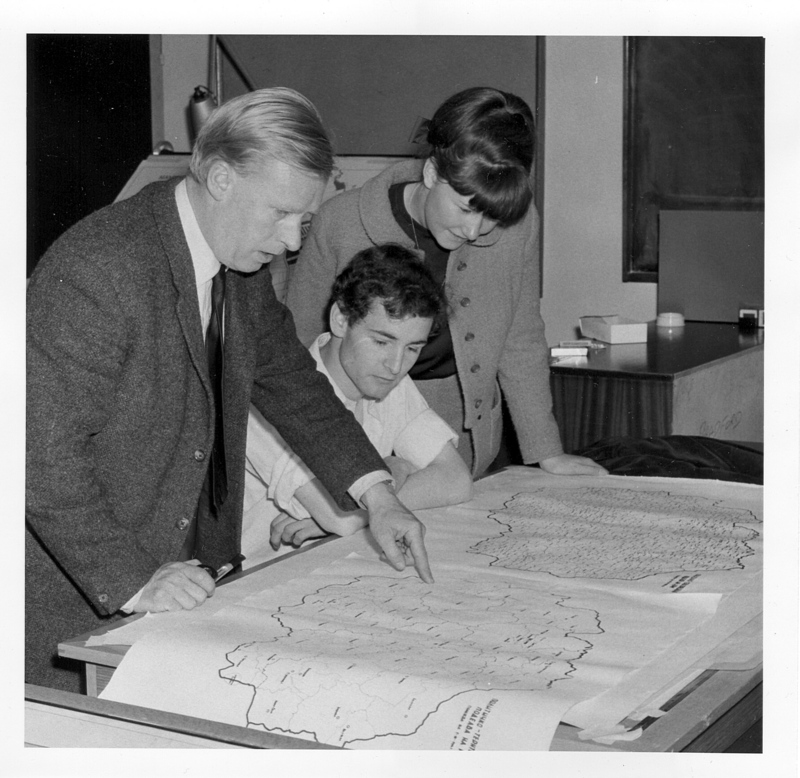 Frank Earnshaw, the then Librarian, took on the task of finding out about academic dress elsewhere, so that our designs did not duplicate those worn by other universities. 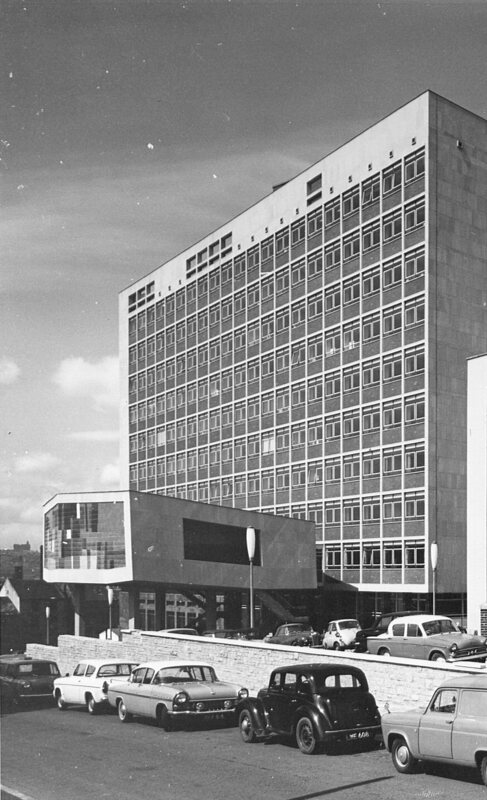 Several other universities were taking shape and making similar decisions at this time, but everyone kept in touch and clashes were avoided. 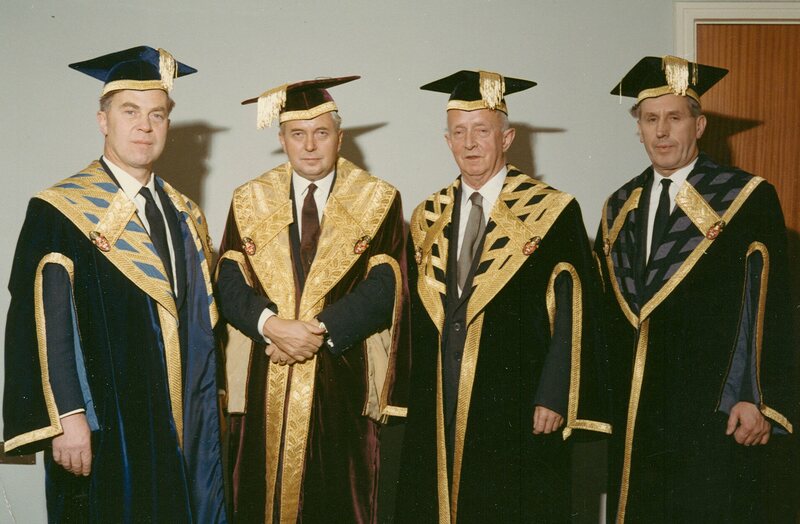 The Committee settled on velvet for the splendid robes of the officers of the University: the Chancellor wore wine-colour, the Pro-Chancellor black, the Vice-Chancellor blue and the Pro-Vice-Chancellor black with grey. The garments were enriched with trimmings of gold braid and moiré and silk linings. 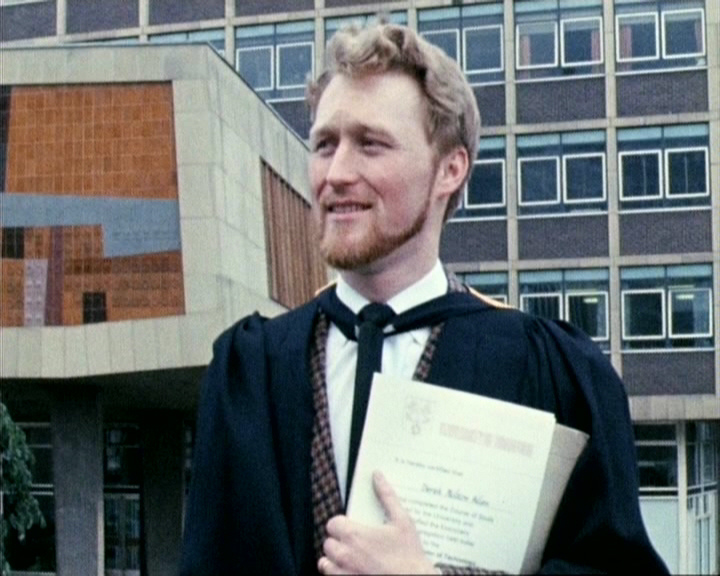 In keeping with the University’s (then) unusual emphasis on involving students in governance, the President of the Students’ Union also had a special gown, of blue stuff trimmed with saffron*. To celebrate our links with local industry and role in the city, much of the design and manufacture of the officers’ robes was carried out by Bradford companies, including Lister and Co, who wove the velvet, Naylor Jennings of Yeadon, who finished the moiré trim, and Denby and Sons of Shipley, who finished the linings. Students from the Regional College of Art prepared the robe designs and University staff from the department of Textile Technology wove the silk linings and moiré collars. As you can see in this 1986 picture, the original heavy velvet gowns were later replaced by lighter ones of black artificial silk with elaborate facings. The Committee chose black for bachelors and masters and scarlet for Doctors of Philosophy. These outfits feature a variety of saffron trims, linking them with the President’s design mentioned above. You might like this video made a few years ago, in which I talk a little more about the University’s robe designs. Like the coat of arms and the University mace, academic dress is part of the magic of higher education, connecting our graduands with scholars past, present, and worldwide. We in Special Collections would like to wish all our 2015 graduands and their families a wonderful graduation day and all the very best in the future! 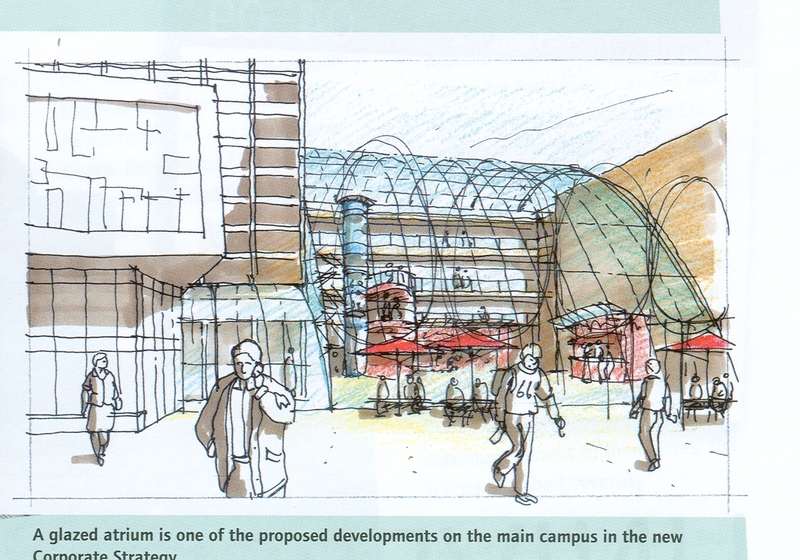 *Saffron, a rich yellowy-orange, is described as the University’s colour, though I have never seen an explanation for this. Possibly a connection with the city’s dyestuffs industry? If anyone knows, do tell me, and I will update if I ever find out.